Paul George's moonshot took him from Palmdale to basketball stardom, and now he's headed to new heights with clouds under his feet. Built on an outsole inspired by moon craters, the PG 3 combines sensational traction with responsive Zoom Air cushioning that helps you move seamlessly between offense and defense. Paul George&apos;s moonshot took him from Palmdale to basketball stardom, and now he&apos;s headed to new heights with clouds under his feet. Built on an outsole inspired by moon craters, the PG 3 combines sensational traction with responsive Zoom Air cushioning that helps you move seamlessly between offense and defense. 1/2-bootie construction creates a snug, secure fit. The padded collar finished with smooth, durable fabric hugs the ankle without sacrificing agility. An outsole pattern inspired by craters on the Moon provides excellent multidirectional traction with a distinct aesthetic. 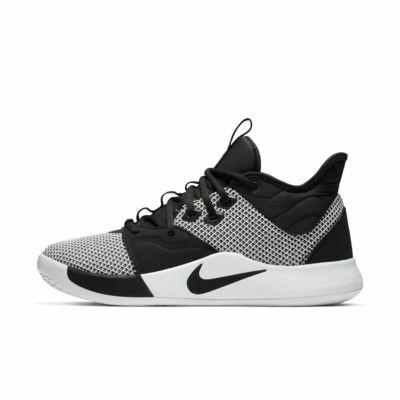 Zoom Air unit offers a springy, responsive feel that provides a little extra oomph on the court. Have to say for $110 it is just as if not more comfortable than more expensive shoes. Traction on point, cushioning A plus.